Location: Celorico da Beira. Grid Reference: 40° 34' N. 7° 19' W (Approx). 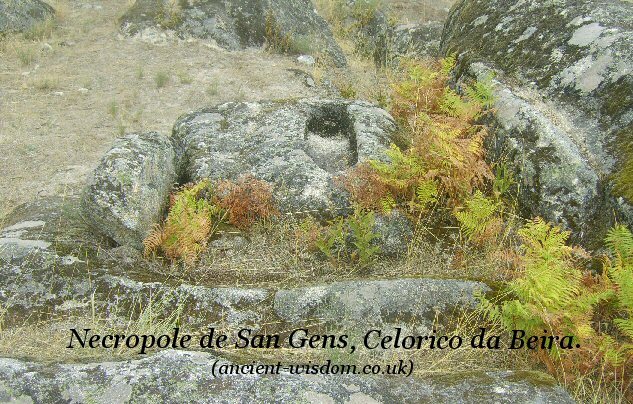 Sitting high on the Serra Biera is the Necropole de San Gens (Saint Gens), composed of around twenty rock-cut sepulchres surrounding the 'Pedra do Sino' - The 'Bell-Stone'. 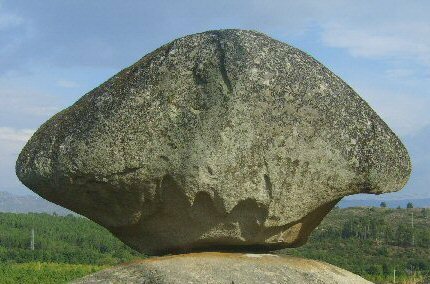 The Bell-stone is a natural centre-point of an atmospheric stone 'theatre', on the landscape. The attraction of the location can still be felt today. Unfortunately, EDP have built a pylon directly over the site (duh..!).. so that one has to endure the crackling of the wires overhead.. 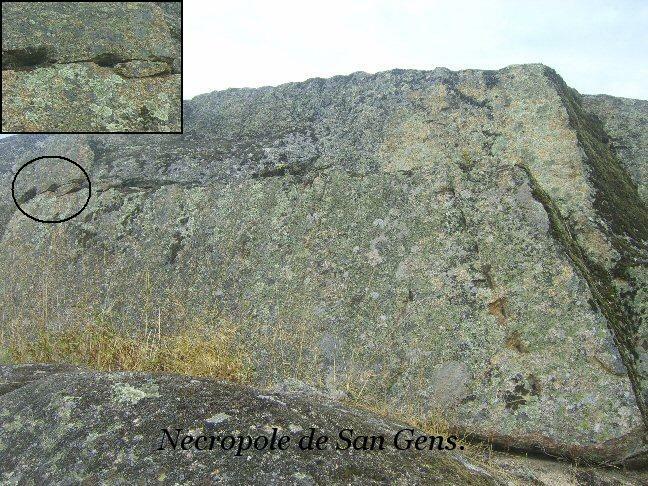 It is perhaps a coincidence that the same natural granite indentations in the bottom of the 'Pedra do Sino' can be seen at the similarly named San Gens dolmen in the Algarve. They also feature heavily in the nearby rocks at the prominent Tapadao site. It is possible that their presence lent in some way to the significance of the site. 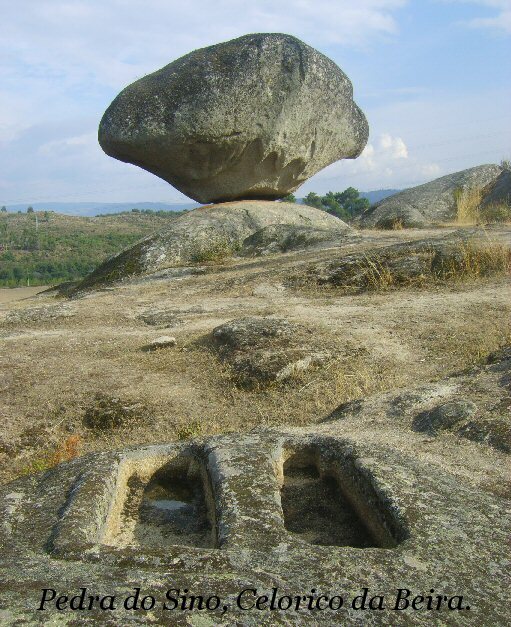 There is a clear preference for being orientated towards the 'Pedra do Sino', however this is only general, and does not apply for several of the sepulchres, which are orientated in a different direction altogether. This sepulchre was for a child (The only one). The rocks surrounding it were also carved. There are also several good examples of quarry-marks for splitting the granite. 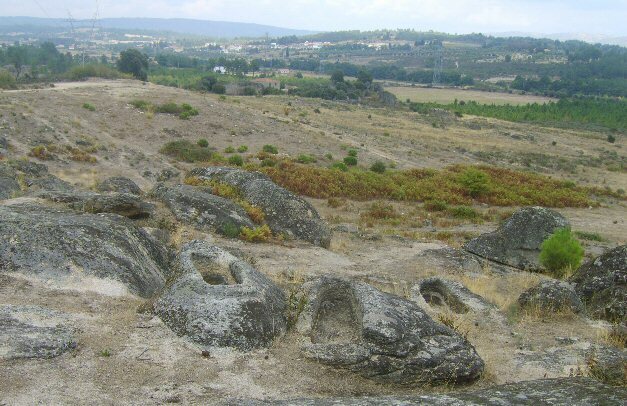 This particular style of splitting granite can also be seen at several other Neolithic sites in Portugal (i.e. Orca complex, Coureleiros, Lacara, etc ).